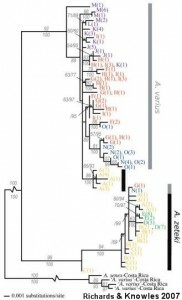 Phylogeographic studies examine the effects of historical landscapes and climates on intraspecific patterns of genetic structure, providing insight into the ecological and evolutionary processes involved in differentiation and speciation. These studies not only contribute to our understanding of the forces that shape present day patterns of biodiversity, but are also essential tools for predicting the ways in which anthropogenic changes, such as climate change and habitat fragmentation, might affect these processes. Our research in this field has addressed (1) the role of landscape heterogeneity in shaping gene flow among populations (Richards & Knowles 2007, Richards-Zawacki 2009, Drabeck et al. 2014), (2) the potential for past climate change to explain phylogeographic patterns among co-distributed taxa (Carstens & Richards 2007, Richards et al. 2007), and (3) the ability of genetic drift to induce divergence despite a lack of long-standing geographic barriers (Knowles & Richards 2005). These studies have contributed to the development of hypothesis-testing frameworks for use in phylogeography and have taken advantage of a diverse set of information sources and analytical approaches, including coalescent analyses and GIS-based climate and distribution modeling. 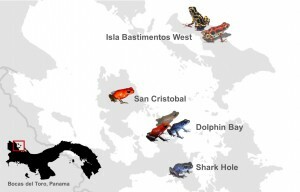 Our ongoing work is using similar tool sets to test alternative hypotheses about the roles of historical geographic vs. ongoing selective processes in generating the amazing phenotypic diversity seen among strawberry poison frog (Oophaga pumilio) populations in the Bocas del Toro archipelago of Panama. Here we are taking a comparative approach, using molecular data from co-distributed reptile and amphibian taxa to ask (1) whether the highly variable O. pumilio exhibits a similar pattern of genetic differentiation to other co-distributed species, and (2) how ancient drainage boundaries and the process of island formation (which occurred as sea levels rose over the past 1,000 – 9,000 years) have shaped the biodiversity we see on the archipelago today.